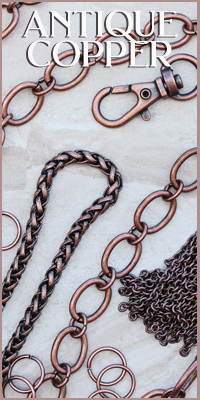 We have select popular chain styles available in shiny copper plate, including rolo, curb, and beading chain. The bright orange color is popular for rustic styles and natural designs, though we have also seen some great elegant designs made with copper! 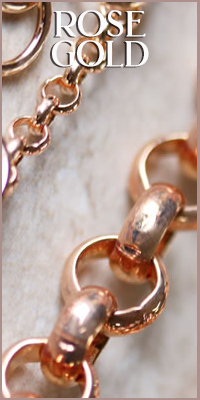 Gold plated chain is a great alternative to solid or gold-filled chains. The core is a hypoallergenic brass chain, electroplated with a gold alloy, then clear coated with acrylic to help seal the plating. This provides a high quality gold-plated chain without the crazy cost of solid gold. With over a hundred styles to choose from, these wholesale spools of gold electroplated chain are one of our most popular products for bead stores and jewelry designers. Shiny gunmetal plated chain has an incredible look - we love it for edgy and gothic styles, but the metallic dark grey also contrasts beautifully with crystals and other bling. 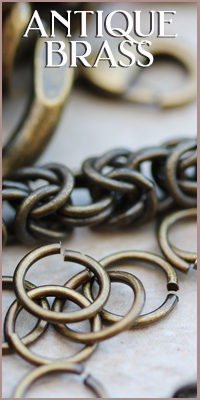 It works very well for unisex jewelry and mixed metal designs. We used to call this black chain, but with the addition of our Nite Black and Nite Black Shiny chains we have renamed it to gunmetal to more accurately reflect the unique deep charcoal color! 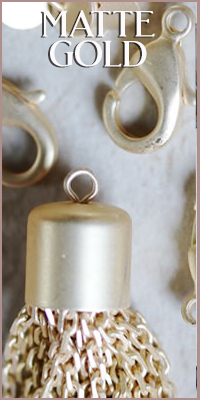 Matte gold or brushed gold is an extremely popular choice for modern jewelry design. It's often used for simple minimalist jewelry, but don't be afraid to use one of our unique chains to make a statement necklace or bracelet! 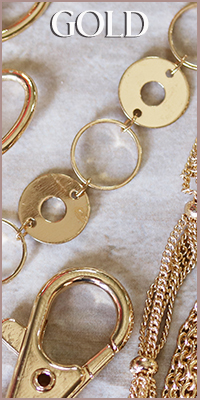 Lately we've seen many choker designs featuring delicate matte gold chains, which we carry in wholesale spools. Our chain is hypoallergenic brass, which is plated with a gold alloy and then coated with a mattifying top coat for that brushed gold look. This plating results in a warm golden finish that has a subtle glow. Our pure black plating has a powdery matte finish for a truly flat black chain. 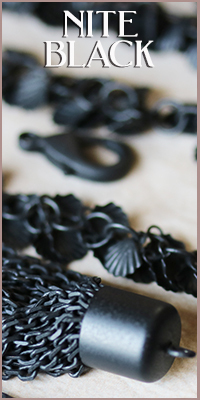 Not to be confused with gunmetal, our black chain is as black as the darkest night sky - hence the name! 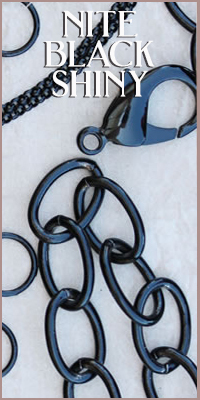 Available in wholesale spools, our blackened chain is perfect for the jewelry designer looking for something unique. 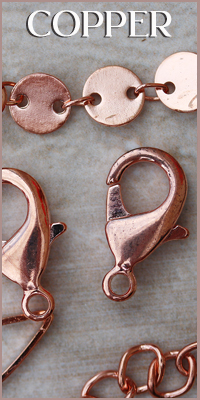 These chains always catch the eye of passing visitors at trade shows, so they are sure to create a unique look for your jewelry line! This color is a pure black plating with a mirrored style black finish. We love this glossy pitch black chain for the sleek and edgy style it brings to any jewelry creation. The chain itself is brass based, with black electroplating and high gloss acrylic coating. We offer a variety of black chains in wholesale quantities with coordinating findings and components. 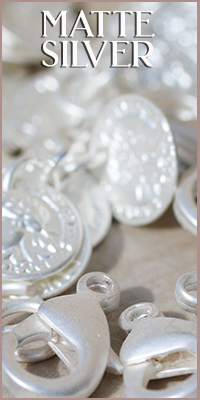 Rhodium plating is a bright chrome finish similar to white gold. In fact, many white gold fine jewelry pieces are plated with rhodium to brighten up the underlying gold plating. 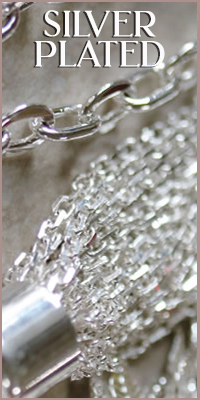 Our hypoallergenic rhodium chains are brass-based, with rhodium electroplating and a clear acrylic coating. We love rhodium chain and findings for their resistance to tarnish - if silver plated components are turning on you, give rhodium a try! 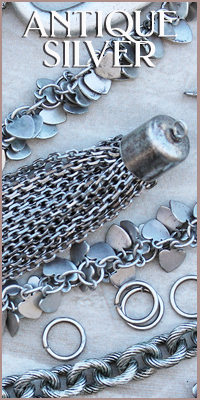 Our huge variety of rhodium chains are also a good match for many of our metal components for leather, if you prefer a shinier look than the antique silver chains. 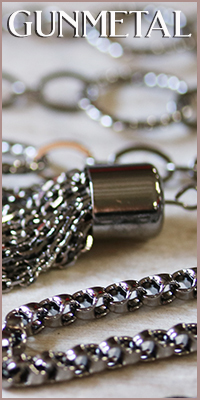 We are happy to carry wholesale spools of popular chains in rhodium, like rolo chain, ball chain, beading chain, curb chain, cable chain, and wheat chain; we also carry fun charm chains, large link chains, dangle chains and more unique designs! 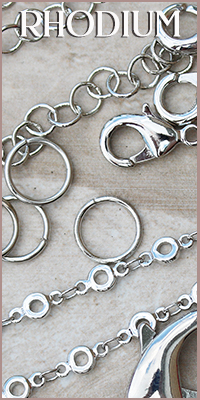 Silver plate chain is a popular and economic alternative to solid sterling silver chain. Our silver plated chain has a hypoallergenic brass core that is plated using real sterling silver, then clear coated with acrylic to help seal the finish. Like solid sterling silver, this plated chain can lightly tarnish over time, which can easily be cleaned with a silver polish or jewelry cleaning cloth for years of wear. 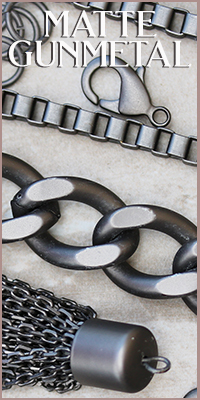 Silver plate is one of our most popular chain finishes and will fit most design styles. It's especially well suited to the simple, minimalist jewelry that is so popular today! Our matte silver chain is base metal electroplated with a matte silver finish. It looks great combined with black or bold colors!